Bill Starr explains that training your biceps has limited carryover to lifting, but targeting your triceps can result in PR snatches and jerks. Everyone who ever set out to improve his physique and get stronger started out by working his arms. Not his back or legs. Arms. Upper arms are a symbol of manhood, especially for youngsters, and bulging biceps show that a lot of hard work has been done to achieve such results. Sometimes those impressive upper arms came about from doing hard labor, but in most cases they were products of long hours in the gym doing countless curls in a wide variety of ways: one-arm concentration curls with dumbbells, two-arm dumbbell curls, curls on a preacher bench, hammer curls, and curls with a barbell—plus some additional work on an EZ curl bar and a curling machine if one was available. 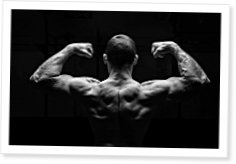 While the other part of the upper arm, the triceps, did not occupy the same high rank of distraction as the lofty biceps, the three-headed muscle had to be worked diligently as well if the athlete wanted to build large upper arms. That’s because the triceps make up two-thirds of the upper arm, so only hammering away at the biceps without spending ample time doing something specific for the triceps just doesn’t get the job done. Yet when anyone is asked to show his arm size, he will, 98 times out of a hundred, hit a double biceps pose. Bill Starr believes finishing the pull is the only way to succeed in Olympic lifting once the plates start adding up. I would love to see a mainsite video demonstration of the pull-over.